The Best iPad Survey Ever! One of the sites that I often check, Dealnews.com, had an article about tablets that was very interesting. They did a poll on those who were thinking of buying a new tablet, and had a lot of questions about the “new” iPad. What’s cool is they used a little creative design to make this way more visual than your typical survey. Way to go guys, this is what I call a survey! There is a very special family at my church that has been an integral part of my life over the years. The Birges have been helping out in the youth ministry for as long as I can remember. Always smiling. Always encouraging others. As I think back to my teen years, going on activities there was this Birge kid always in the middle of everything. Well I guess I am an old man now because Travis Birge is no longer a kid, haha! Travis is heading out this week on a 6 month trip to Chile, South America - to train and assist one of our missionaries there. We have been working together on a project that will serve as a Business Card/Prayer Card. We wanted something that would have all his contact information on it, but also serve as an inspiring reminder for people to pray for him. After a little brainstorming and design work, I think we got the perfect solution for him. I got them in the mail on Thursday and couldn’t wait to show him; they really turned out awesome. He will have these at church on Sunday, his last one with us, so be sure to pick one up. I hope these cards will help remind people to remember him in prayer, and also encourage them to follow his updates online during his leave. I also hope that it will encourage someone to get involved. 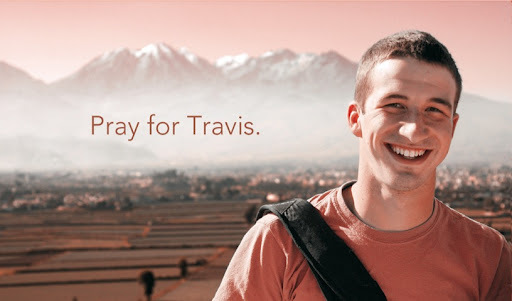 Travis has only a portion of his necessary funds, and is relying on others sponsoring him for the remaining cost. I am so proud of Travis, and I know that he will learn a lot from his training. Even more so, I know that the Lord will increase his faith as he steps out to do His will. We will miss you while your gone Travis, but we are excited to see the Lord working in your life. Adios Amigo! 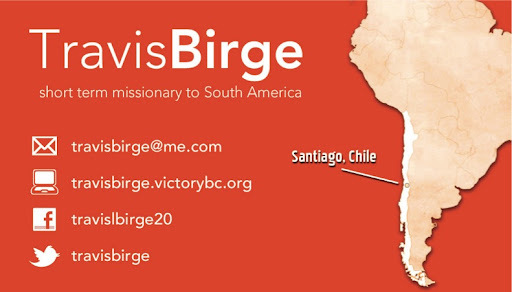 You can follow or contact Travis from website http://travisbirge.victorybc.org/ or any of the info below. Got some new software recently, just trying it out. This is a quick intro I made with one of the preloaded templates from Motion 5 and some effects from Final Cut Pro X. You can get a free one month trial for both of these at the App Store. So, even if you don’t really need the software, but want to create a few videos or intros like this for a project or website, it’s worth tryin’ out. The great thing is, this only took me a few minutes to do. I may put some more stuff up once I learn a little bit more about these programs.